Are you looking for a fun, unique gift for a loved one? All of these gifts are great and you the chance to give back to help the pets of KC Pet Project. Run All the Miles, Save All the Pets shirts to show your love of running and of helping pets! Available in Blue in Unisex sizes and Pink in Ladies Sizes. You can also get the runner in your life some great KC Rescue Runners merch that they can wear at races all around town. Proceeds from sales benefit our pets. They can be purchased at our three adoption centers. Get the yummiest book of the holiday season! Check out Give & Partake’s Mac and Cheese book where you get to dine at nearly 30 restaurants around the metro area and when you buy an entrée at participating restaurants, you get a free mac and cheese dish. When you purchase the book, half of the proceeds will come back to help the pets of KC Pet Project. Get your book today through the Give & Partake website, at KC Pet Project’s Zona Rosa location, or at Do Good KC. 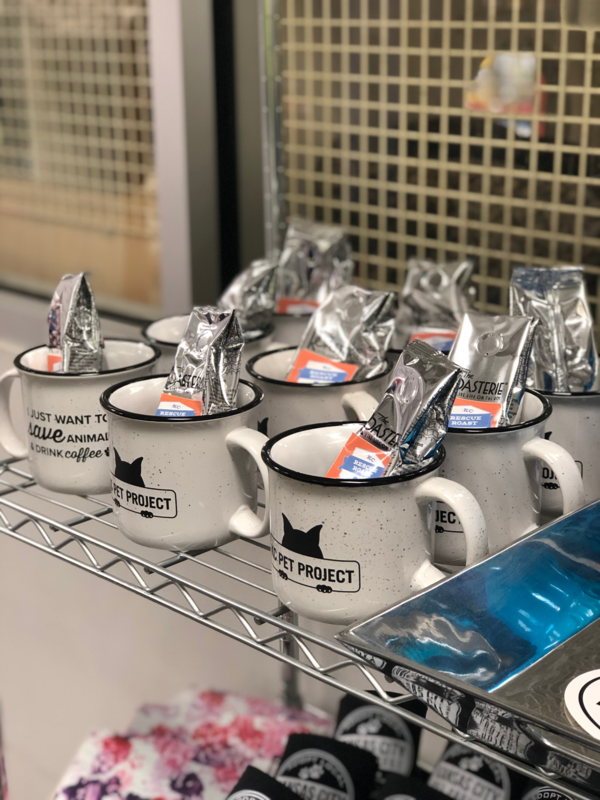 Did you know KC Pet Project has our own Roasterie Blend coffee? You can purchase it at all three of our locations or on the Roasterie website. KC Rescue Roast blend comes in Ground, French Press, or Whole Bean (only sold in Ground at our locations). Show your support of saving all of the pets with this adorable KC Pet Project campfire mug. You can purchase these great gifts at any of our locations and package it with the KC Rescue Roast. Do Good Co. is an amazing store on 39th Street that promotes doing good in the community. A revolving collective of curated home furnishings, apparel and accessories. Do Good Co. is committed to supporting our non-profit community through curated goods, workshops, events and volunteer opportunities. Proceeds from all sales of this store support the pets of KC Pet Project and the kids of KidsTLC. You can also purchase KC Pet Project merch at this location. Do Good Co. Gift Cards are a great gift for the holidays! Purchase a gift to help the pets of KC Pet Project. Check out our Amazon Wish List for information about items needed for all locations! Don’t forget, KC Pet Project is an Amazon Smile recipient so select our shelter to receive a portion back of your purchase. Do you want to be involved with the KC Pet Project and help the animals in our care but don’t have time to volunteer or the space to adopt a new family member? Is your company looking for a rewarding way to give back to the community? Then the Kennel Sponsorship Program is for you! By sponsoring a dog or cat kennel, you will be providing the much needed funds that will handle the care, feeding and basic medical expenses for the dog or cat in your sponsored space. Stop by any of our three locations to check out our KC Pet Project apparel and other fun items to show your support of our pets. We have tshirts, leashes, bowls, etc to support our pets. Winter Frenzy Fee Waived Adoptions!